LET us ponder, for just a moment, the significance of the number 40 in Judaism and Jewish life. The ancient Hebrews wandered for 40 years in the desert on their way to the Holy Land. The torrential rains that resulted in the flood of Noah also lasted for 40 days and 40 nights. To be considered ritually pure, a mikveh must be filled with 40 measures of water. The Mishnah teaches that a person who has lived for 40 years gains understanding. Traditional Jewish mystics believe that a man must be at least 40 years old in order to have gained sufficient knowledge and wisdom to study the Kabbalah. Denvers Israel Study Tour is 40 years old this year. Granted, the last item on the list might be somewhat less significant than the others, but hey, here in Denver its a pretty big deal. The Israel Study Tour, or IST as it is commonly and affectionately called, has long been a source of pride in the Colorado Jewish community. It remains, says Robin Hanssen, the community activist and leader who runs the IST today (and who is an alumnus of the tour herself), a cause of envy for many other American Jewish communities. And the trip  a week in Poland followed by six weeks in Israel for soon-to-be high school seniors  changes its participants lives for at least 40 years to come. In fact, says Hanssen, director of youth services for the Colorado Agency for Jewish Education, IST exists precisely to enhance, and quite often create, a strong sense of Jewish identity for the young people who participate in it. Although the first formal tour took place in 1972, Hanssen says a smaller precursor trip took place in 1971, hence the current 40th anniversary which will, she adds, be ceremoniously marked at CAJEs annual dinner this coming August, at which a good number of IST alumni are expected to be present. The first trip was highly informal and totally non-organizational, says Anita Wenner, a self-described walking encyclopedia on CAJE, of which she is a former director. A Denver couple, Mary Lou and Bob Rotman, took some of their own teenage children and a handful of others to Israel in 1971, setting an example that the community soon took notice of. The second and third trips came under the aegis of the JCC, Wenner says, and only by the third trip, in 1974, did CAJE take it over. Under CAJES first and second directors, Avi Brown and Tzvi Berger, and its third, Wenner, participation in IST expanded dramatically. In 1977, a new high of 70 teens went on the tour. The early trips were considerably different from todays, Wenner adds. For a while, it was operated jointly by CAJE and the Rocky Rabbinical Council, which always sent a member rabbi along for the entire trip. It was also much more structured along formal educational lines than today. Early ISTers spent four weeks of half-day classes at The Hebrew University and were able to earn social studies credits in their high schools back in Denver. The last two weeks of the tour were spent traveling around Israel. Unlike today, in which IST participants go to Poland for a week before heading to Israel, the old ISTs were conducted exclusively in Israel. Also, in the pre-laptop and pre-cellphone days of the 70s and 80s, Wenner adds, it was much harder for tour participants to stay in touch with their families in Colorado. Wenner would set up regular phone chains with Denver families to keep them updated on how things were going for their kids in Israel. Wenner, who describes her skills as administrative, always stayed in Denver during the tours and enjoyed serving as the communications link between the ISTers and their loved ones. For many subsequent years, the IST fell under the thorough and energetic supervision of Risa Buckstein, now retired from her full-time CAJE position and serving as a consultant to the organization. Hanssen assumed her current position at CAJE last July, handling a variety of duties but concentrating on IST. She worked at CAJE several years ago as IST alumni coordinator, later taught at DAT and then ran the Community Talmud Torah, which will close at the end of the current school year. 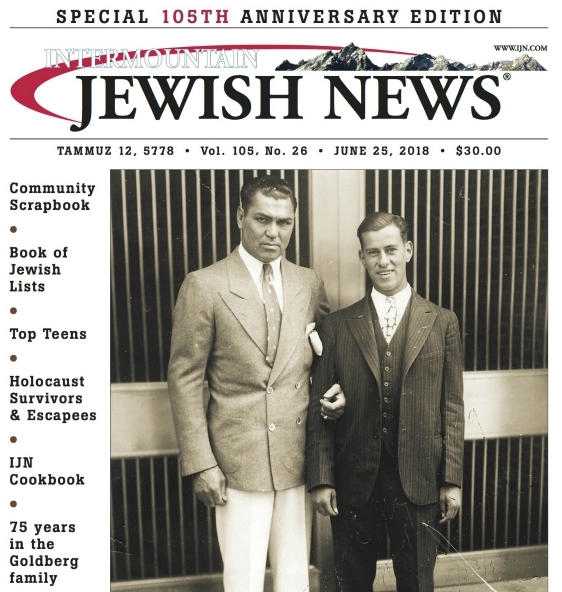 Hanssen estimates that over 2,000 Denver Jewish high school students  most of them 17 years old, in the summer between their junior and senior years have participated in IST. The numbers have gone as low as the 30s during the lean years of the intifada, and up to 120 in flush years. Last years participation was 66 students. This year the number is expected to be 62, which is about average. The most successful IST in terms of numbers took place in 2000, when 122 students went, a tour that Hanssen describes as a four-bus trip, meaning it took four buses to transport the students. Technically, that trip was divided into a trip A and trip B for practical reasons. There was only one year in which the IST didnt happen  2002  due to parental concerns over the violent Palestinian intifada. The IST was one of the earlier Israel trips designed for American Jewish teens and is a survivor from an era when there were many of them. In the 1970s and 80s, many American Jewish communities sponsored and organized Israel trips for their teens. In time, Hanssen says, most of those trips closed down in the face of competition from nationally organized Israel trips sponsored by such organizations as NFTY, BBYO, Camp Ramah, USY and NCSY. Birthright Israel, financed by national philanthropists and foundations, has become the largest and most visible of these. It is open to youths just after high school graduation into their early 20s. Since IST and Birthright target different age groups, Hanssen says, there is no direct competition between them, but she moderates her answer. Yes and no, she says. There are some students who dont want to go on this trip because they assume that theyre going to go on Birthright instead. But the trips are nothing alike. The dynamics of a Birthright trip are fantastic for sure  its a really fast and crazy 10 days, kind of a highlight, that has nothing of the depth and length of IST. The IST is financed by the local community, which supplements the money that parents are able to come up with for the tour. Many Denver-area synagogues sponsor students from their congregations by providing funding. Another important source of support comes from people whom Hanssen calls angels, strictly anonymous community members who have provided sustained and generous donations to keep the IST viable. Despite the recession and the resulting budgetary pressures on the Jewish community, Hanssen says the IST appears to be on solid financial footing. My sense is the synagogues that give money to this program have not reduced the amount that they give to their students over the last several years, which suggests that they still are invested in this program, she says. The federation system is now more equitable and has been very generous. WHEN Hanssens own trip to Israel as an ISTer came 24 years ago, in 1987, all of the trip was spent in Israel, with no Poland option. From her current perspective, she says, there are a number of striking differences between then and now. When she went, the students were filled with a great deal of unquestioning pride in Israel  something that has changed somewhat in 2011. Theres a lot more confusion about being pro-Palestinian, a lot more confusion about how do I understand the Israeli-Arab and the Palestinian conflict as a political one versus a human rights one, she says. In 1987, Hanssen says, Israel was also a far more casual place than it is in 2011. We really make sure that safety is the number one, key priority for these students, she says. Israel, Hanssen adds, is also busier now. Another striking difference can be seen, Hanssen feels, in the religious orientation of todays students contrasted with those a quarter century ago. While students from the Reform Temple Emanuel and Temple Sinai are still the largest IST constituency, the 2011 IST includes students from 11 synagogues and 23 high schools, including private, public and day schools, clearly indicating greater religious diversity. Today, students from strictly atheist to modern Orthodox are now routine IST participants, Hanssen says. That wasnt always the case. When I went on the trip, out of 80 kids I was one of a very small handful that was more active, that kept kosher, that had gone to a Jewish day school, that had been to Israel before, she says. WHILE todays youths are more open to religious diversity within Judaism, they are also more open to multiple streams of thought on the subject of Israel itself. Many IST participants are well aware of the fierce anti-Israel activism thats currently sweeping over American campuses and theyre asking questions about it. Tour participants study at CAJEs Hebrew High School as preparation for their trip. The school recently invited members of the David Project to discuss such anti-Israel criticism with the students. For many of them, it was the first time theyd heard of BDS (the Boycott, Divest, Sanction movement) and the apartheid issue, Hanssen says. CAJEs intention is not to propagandize IST youths, but to educate them, she stresses. Its called the Israel Study Tour for a reason, Hanssen says. Its not the Israel Party Tour or the Israel Sightseeing Tour. We are looking for students who have a vested interest in learning. Im not sure we brought [the David Project] in out of worrying as much as our continuing interest in education, she says. At Hebrew High before the trip and in Israel during the trip, tour leaders see their role as answering all students questions in full acknowledgment that there are two sides to the Israeli-Palestinian story. There remains, however, a bottom line, Hanssen emphasizes. She definitely doesnt feel that pro-Israel cheerleading and simplification are sound educational approaches. ONE thing that hasnt changed significantly about IST is the emotional impact the trip can have on many of the students. Israel has always been emotional for American Jewish visitors, especially first-timers, and ISTs additional week in Poland  with its emphasis on the Holocaust  can make the trip a real emotional rollercoaster. It may rock you and shake you up, Hanssen says. Its our job to be there, to talk to you, to help you process that. She also tells students that the emotional or spiritual impact of the tour might not hit them until weeks or months later and she advises them to be prepared for it when it happens. Hanssen counters criticism of IST and similar tours that the journeys are, in fact, designed to be emotionally manipulative  that the dramatic contrast between touring death camps in cloudy, once rabidly anti-Semitic Poland and seeing the Zionist dream come alive in sunny, Jewish Israel creates a psychological effect that amounts to behavior modification. I would counter the people who say that theres this manipulation by pointing out that they havent seen what were doing recently, she says. In Poland, for example, while the tour visits death camps and discusses the Holocaust, the educational emphasis is much more on rebirth than death. Weve actually worked very hard to make our Eastern Europe part much more about Jewish revival and the positives and strengths, Hanssen says. The relationship of the Holocaust to the creation of Israel is a reality that can be seen and taught in a positive light, Hanssen says. And its not just singing the praises, glories and victories of Zionism, she adds. She hopes to discuss with ISTers such subjects as how the Holocaust may have created an anti-religious attitude among Israelis who valued strength and militarism over the weakness and submission they associated with religious European Jews, and how such Israeli militarism may still be manifesting itself today. By the same token, the positive dimensions of Israel and the Zionist experiment  and they are many, Hanssen says  will certainly not be ignored. The story of Israel, again, is a complicated one, and IST has no intention of simplifying it for thinking students. We want the students exposed to a lot, Hanssen says. Of the 2,000 Denver-area kids who have gone to Israel via IST since 1971, she adds, the vast majority that I talk to do say that it impacted their lives in ways that they never expected, Hanssen says. And that, she says, is precisely the point of IST. Jewish camps are incredible, Jewish education can be incredible, Jewish community programs and structures are incredible, but going with a group of peers and playing this out in a foreign country that is somehow theirs is very powerful as a tool for making sure that they can gain insight into why being Jewish matters. Israel has always been emo- tional for American Jewish visitors, especially first- timers, and ISTs additional week in Poland  with its emphasis on the Holocaust  can make the trip a real emotional rollercoaster. Previous PostReform Jews tussle over Jacobs Next PostIf sharia banned, is Halachah next?